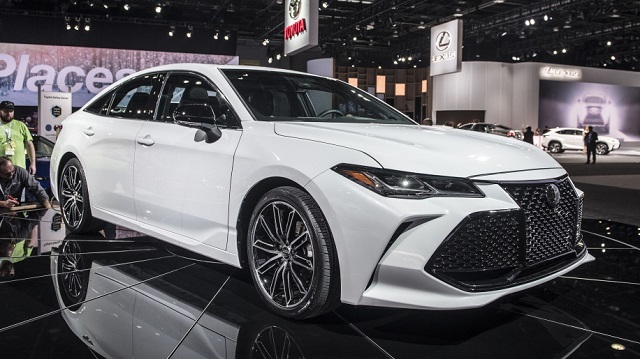 At the 2018 North American International Auto Show in Detroit, the Japanese manufacturer has unveiled its fully refreshed large sedan, the 2019 Toyota Avalon. The current model has been redesigned back in 2013, and now it was the right time to give it the eagerly expected upgrades. The Toyota Avalon is an attractive sedan which provides a comfortable and supple ride. It is provided with many modern safety features and offers a roomy interior. However, it could get a bit pricey in higher trim levels. Nevertheless, the 2019 version will now enter the fifth generation and is going to bring a number of important changes. For starters, the brand-new Toyota Avalon will be switched to the new platform and will be a bit larger than its forerunner. The whole exterior design, which is already very handsome, will be revised and the 2019 Toyota will get even prettier. Of course, a host of safety equipment is expected as usual. However, it seems that the Android Auto connectivity will be left out as before. Under the hood, we expect the same traditional unit but the hybrid version will be available also. Furthermore, the 2019 model year will be offered in following trims: XSE, Touring, XLE, and Limited. A non-hybrid 2019 Toyota Avalon will get the same, a 3.5-liter V-6 engine under its hood. However, it will be more powerful than the previous model. It is capable of making 301 horses and 267 pound-feet of torque. This engine will work with an 8-speed automatic. The hybrid model will get a 2.5-liter inline-4 Atkinson cycle unit combined with electric motors. The total output of this powertrain will be up to 208 horsepower. It will pair with a continuously variable transmission. All the models will come standard with front-wheel drive. The 2019 Toyota Avalon will ride on a version of the Toyota modular TNGA architecture which also underpins the Camry model. 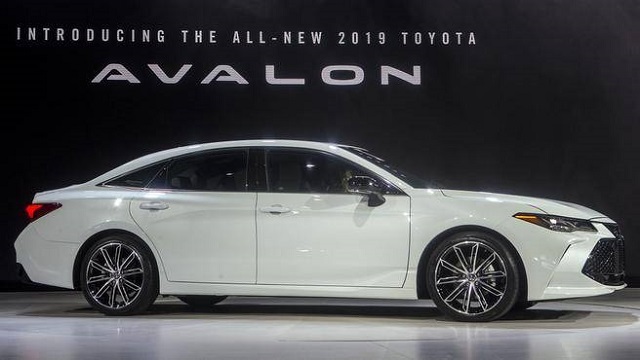 So, the new Avalon will be slightly larger featuring two inches more in the wheelbase and less than an inch in length. As well, it will be slightly lower and wider which will give it sportier look. Speaking of the external appearance, the 2019 version will get cleaner and more elegant design. The hood seems longer and on the front, there are optional LED headlamps. As well, there will be two new designs of the grille with more black or more chrome details. The rear end will now feature quad exhaust outlets for the first time. The base model will be fitted with standard 17-inch wheels while the range-topping trim level will ride on the 19-inch alloys. The interior of the 2019 Toyota Avalon will also receive cleaner and more modern look. The dashboard will feature a large 9.0-inch touchscreen with infotainment system and Apple CarPlay. Unfortunately, the Android Auto once again won’t be in the offer. In the safety department, we can expect adaptive cruise control, 10 airbags, a rearview camera, lane-departure warning, rear cross-traffic alert, active lane control, automatic high beams, and automatic emergency braking. The 2019 Toyota Avalon should go on sale this spring. The pricing is not known for now, but it will be higher than the price of the current which is around $34,000.